The ProtonVPN Beta Program gives you early access to new VPN features and updates that our team is working on. All users can enable the Beta Program for our Windows, macOS, or Android VPN app. As a community supported VPN service, we are here to serve you and we take your feedback very seriously. That’s why we always strive to let the community participate in product development and decide how ProtonVPN should evolve. Whether it’s letting you choose where to put new VPN servers or inviting you to help improve new apps, we take your feedback seriously. 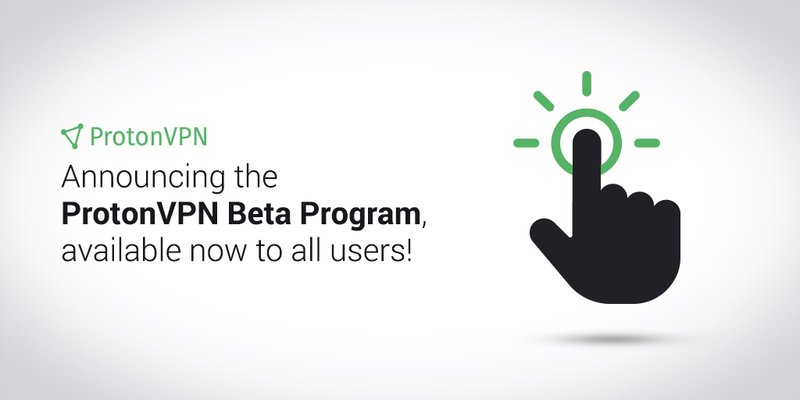 We have already implemented our Android Beta Program for ProtonVPN. Today, we are expanding the ProtonVPN Beta Program to also include our macOS and Windows clients. The Beta Program gives you early access to new servers, UI updates, stability improvements, and more. Whenever our developers release new versions of these applications to our team for internal testing, you will receive updates at the exact same time. We are doing this so we can get your feedback about new features and product changes earlier, and take your input into account for the public releases.